Upper Yosemite Fall at Yosemite National Park, one of the crown jewels of America’s national park system. Photo by author. Recently, my wife, Kathy, and I arrived in Sonora for our first Outdoor Writers Association of California (OWAC) conference. We were a little apprehensive, being new kids on the block, but by the end of the first day, we felt a kinship with everyone in the room. And what a room it was−filled with authors, columnists, radio hosts, photographers, newspaper reporters, adventure guides, and media experts from all over the Golden State. The common thread that wove this gracious group of professionals together was a reverence for California’s vast natural resources and a desire to tell the world about them. Yelloweye rockfish (Sebastes ruberrimus). Photo by Retired Fish and Game Warden Larry Bruckenstein. Imagine you’re fishing somewhere off the California coast and you hook into a big one. You finally hoist the monster to the deck and discover it’s nearly three feet long, brilliant red-orange in color, with bright yellow eyes the size of fifty cent pieces. Hard to imagine this fish could have been swimming around in the ocean when Roosevelt was president−not Franklin (1933-1945), but Teddy (1901-1909)! Yelloweye rockfish (Sebastes ruberrimus) are known to live up to 118 years. Very slow growing, they don’t reach sexual maturity until they’re between ten and twenty years old. 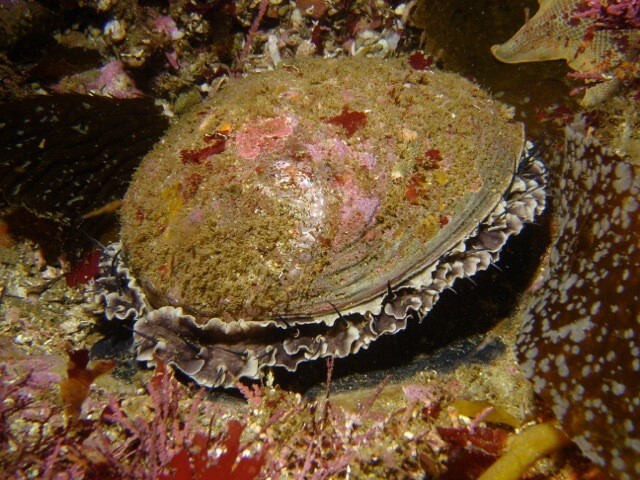 Saving California’s remaining abalone fishery from money-hungry poachers is a daunting task. By telling the stories of dedicated wildlife officers in my upcoming sequel to “Badges, Bears, and Eagles,” I hope to educate the public and, in some way, help conserve this precious resource for law-abiding sportsmen and future generations. Out of Ventura Harbor we sailed this past November, in pursuit of a long-held dream. My wife Kathy and I had been waiting for years to visit Santa Cruz Island, the largest of California’s Channel Islands and part of the five-island Channel Islands National Park. We spent the day hiking the island and learning about the indigenous plants and animals that inhabit this fascinating archipelago, just twenty miles from the mainland. Being scuba divers, we were especially impressed by the crystal clear waters that surrounded the island, beckoning us to return someday with our scuba gear and underwater camera. For decades, there have been major concerns about the depletion of California’s marine resources. In 1999, the Marine Life Protection Act was established, mandating that the California Fish and Game Commission designate marine protected areas where fish, habitat, and other priceless marine resources are allowed to recover. This statewide network was completed at the end of 2012, with 124 designated protected areas from the Oregon border to Mexico. Specific regulations may exist for individual marine protected areas (MPAs), so contact the Department of Fish and Wildlife before fishing or conducting any type of outdoor activity in these areas. Maps, GPS coordinates, and specific information are available. To learn more, go to https://www.dfg.ca.gov/.